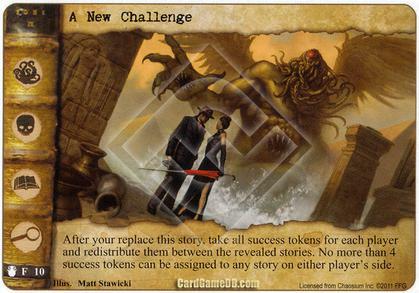 After you replace this story, take all success tokens for each player and redistribute them between the revealed stories. No more than 4 success tokens can be assigned to any story on either player's side. 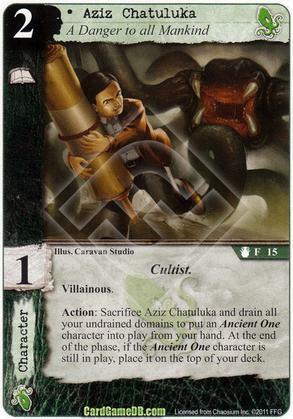 Action: Sacrifice Aziz Chatuluka and drain all your undrained domains to put an Ancient One character into play from your hand. 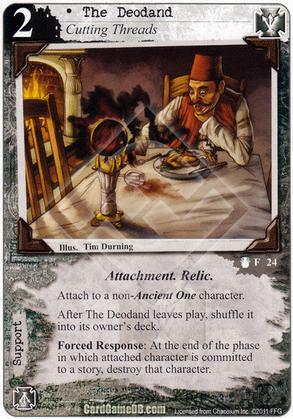 At the end of the phase, if the Ancient One character is still in play, place it on top of your deck. 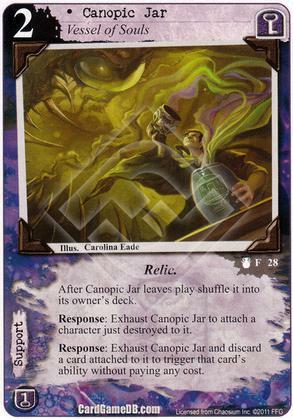 After Canopic jar leaves play shuffle it into its owner's deck. Response: Exhaust Canopic Jar to attach a character just destroyed to it. 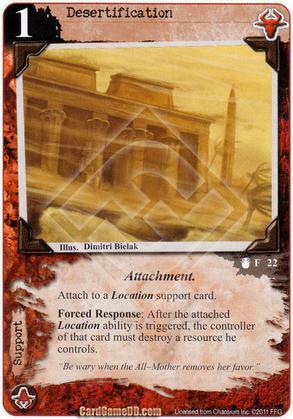 Response: Exhaust Canopic Jar and discard a card attached to it to trigger that card's ability without paying any cost. Choose 1 domain you control. Take all resources attached to it and place them in your hand. 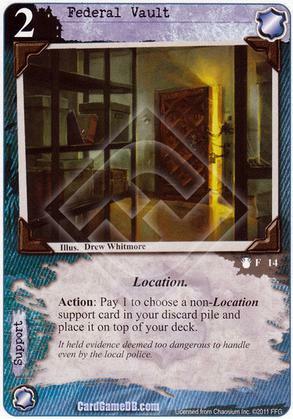 Replace those resources with an equal number of cards from the top of your deck. 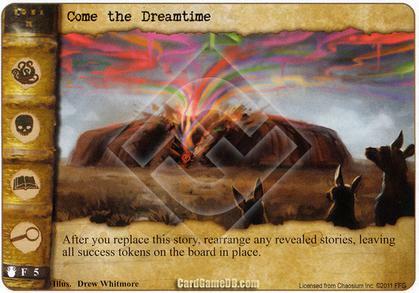 After you replace this story, rearrange any revealed stories, leaving all success tokens on the board in place. Each player must shuffle his hand into his deck and then draw the same number of cards. 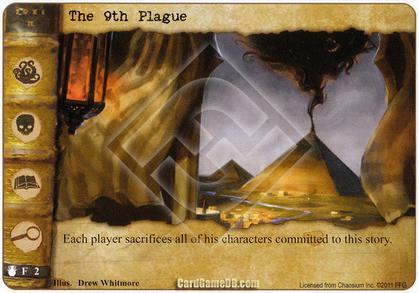 Then the player who won this story draws 1 card. "Be wary when the All-Mother removes her favor." It held evidence deemed too dangerous to handle even by the local police. Each player names a card type. 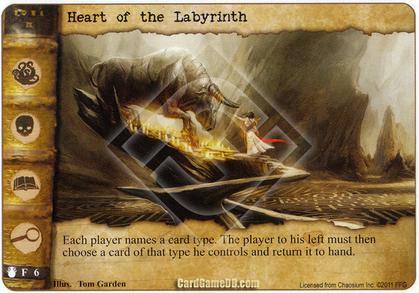 The player to his left must then choose a card of that type he controls and return it to hand. Dead or alive... but mostly dead. Attach to a character you control. Attached character gains Toughness +1. 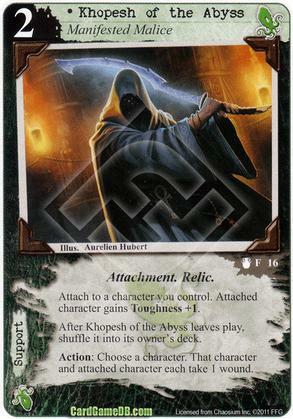 After Khopesh of the Abyss leaves play, shuffle it into its owner's deck. Action: Choose a character. That character and attached character each take 1 wound. Action: Pay X to reveal the top X cards of your deck. 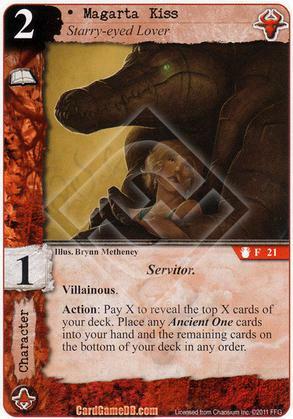 Place any Ancient One cards into your hand and the remaining cards on the bottom of your deck in any order. 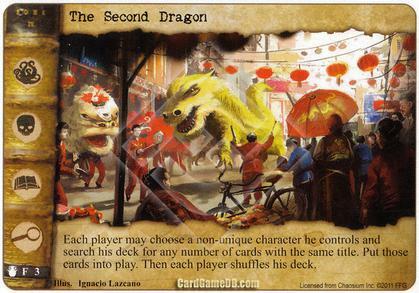 Action: Discard a card from your hand to choose an insane character. Restore and ready that character, and take control of it until the end of the phase. The strings of a weakened mind are easily pulled. 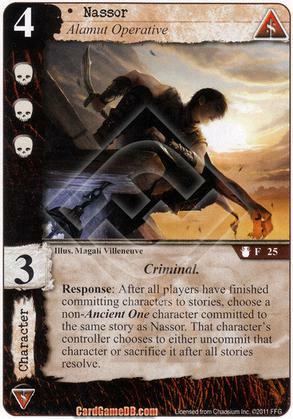 Response: After all players have finished committing characters to stories, choose a non-Ancient One character committed to the same story as Nassor. That character's controller chooses to either uncommit that character or sacrifice it after all stories resolve. 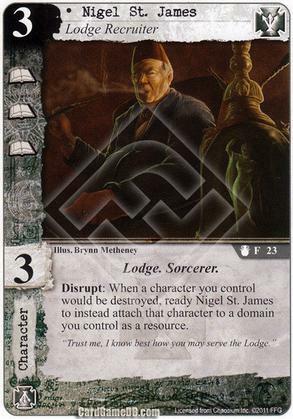 Disrupt: When a character you control would be destroyed, ready Nigel St. James to instead attach that character to a domain you control as a resource. "Trust me, I know best how you may serve the Lodge." 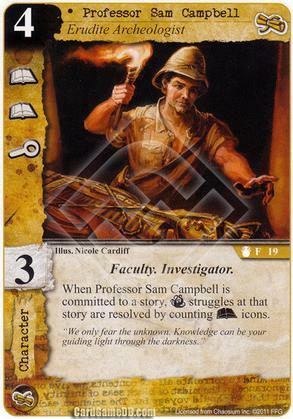 When Professor Sam Campbell is committed to a story, Terror struggles at that story are resolved by counting Arcane icons. "We only fear the unknown. Knowledge can be your guiding light through the darkness." 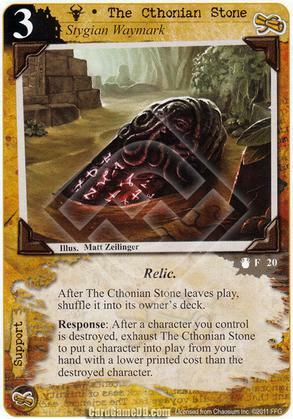 After the Cthonian Stone leaves play, shuffle it into its owner's deck. 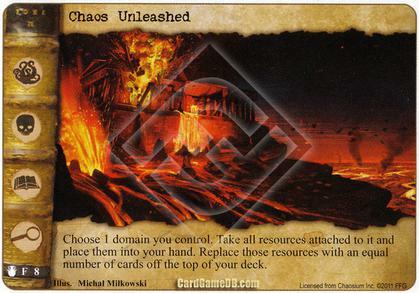 Response: After a character you control is destroyed, exhaust The Cthonian Stone to put a character into play from your hand with a lower printed cost than the destroyed character. 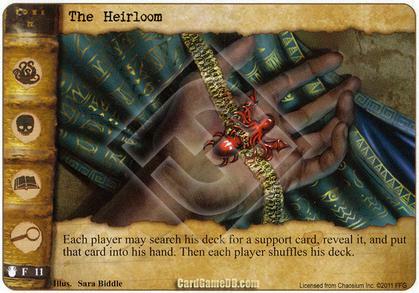 Each player may search his deck for a support card, reveal it, and put that card into his hand. Then each player shuffles his deck. 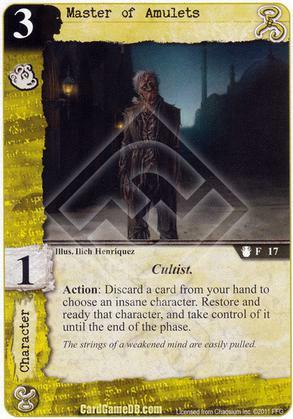 Forced Response: After a player succeeds at a story, he must discard 2 card from the top of his deck. 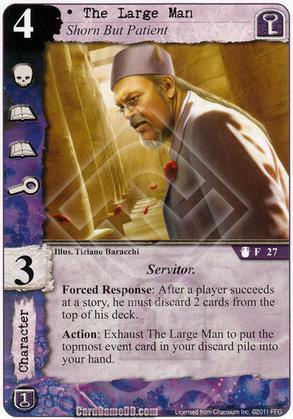 Action: Exhaust The Large Man to put the topmost event card in your discard pile into your hand. 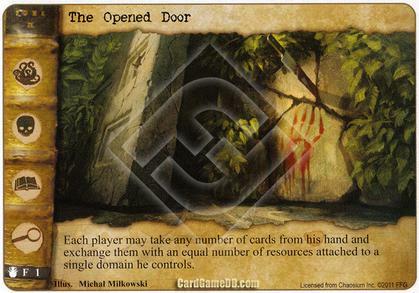 Each player may take any number of cards from his hand and exchange them with an equal number of resources attached to a single domain he controls. 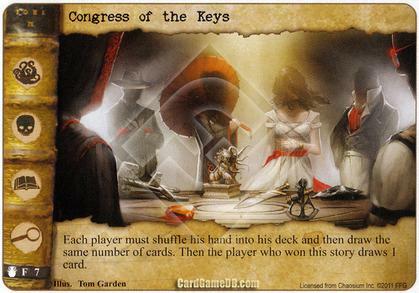 Each player may choose a non-unique character he controls and search his deck for any number of cards with the same title. Put those cards into play. Then each player shuffles his deck. 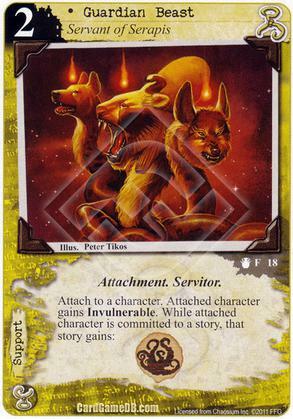 Search the story deck and choose 1 story card. resolve that story's effect and then place into your won pile. 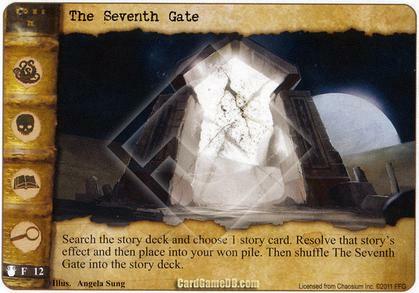 Then shuffle The Seventh Gate into the story deck. 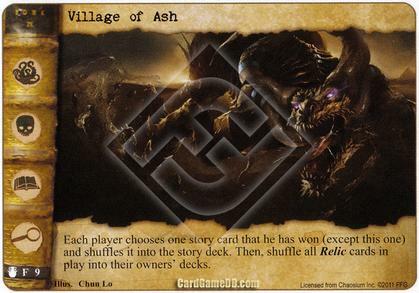 Each player chooses one story card that he has won (except this one) and shuffles it into the story deck. 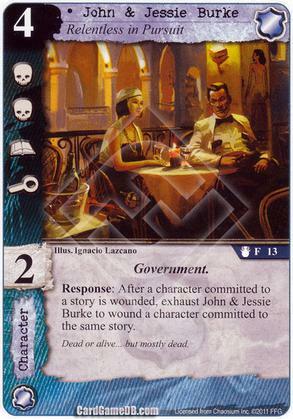 Then shuffle all Relic cards in play into their owners' decks. 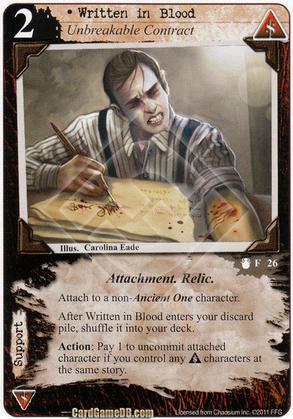 After Written in Blood enters your discard pile, shuffle it into your deck. 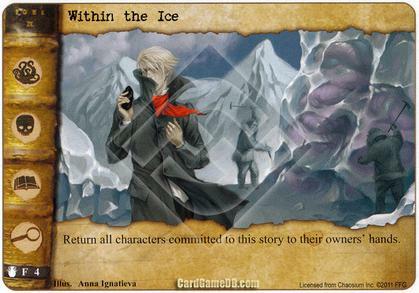 Action: Pay 1 to uncommit attached characterif you control any Syndicate characters at the same story.